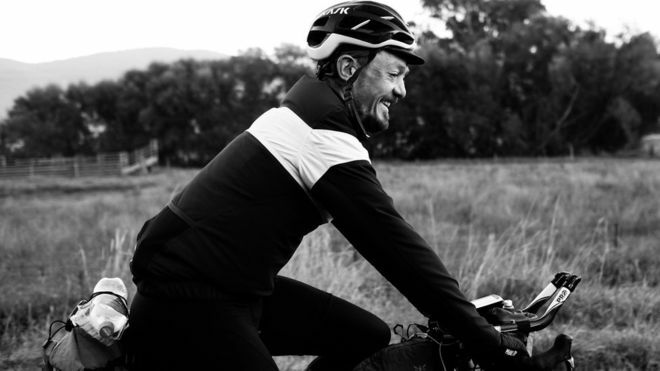 The Indian-Pacific Wheel Race has been cancelled due to the tragic death of UK cyclist, Mike Hall, an ultra-endurance cycling athlete who set records, won races, and created the Transcontinental Race, an ultra-endurance cycling event across Europe. Details on the story can be found by clicking here. Statement: On behalf of The Trans Iowa Family, and myself , we would like to extend our heartfelt condolences on the loss of Mike Hall to his family, friends, and all who Mike touched during his all to brief life. Personal Comments: It is difficult to write about such occurrences, for many reasons, yet I feel compelled to express something. First of all, I never met Mike Hall, but he did reach out to me last year and asked about Trans Iowa. He expressed some interest in doing the event at some point after he had done a few other things he was aiming for. So, beyond that, all I know of Mr. Hall is the accomplishments he had and now by the tributes that pour out at the news of his death. I am struck by how many are being touched now. It is a huge testament to the man and shows us all how our actions can affect so many people, even though we may never meet them. Something to consider. It also shows me how tightly knit the cycling community is, or can be. Something else to consider. But for now, it is time to express feelings and hopefully to learn from Mike's example. Levers have arrived. Thanks Gevenalle! So, as many of you know I have been resurrecting this ten year old fillet brazed frame and fork I have here. The conundrum was that I had to decide upon a drive train and I wanted it to be silver as much as possible. That was the plan ten years ago but I never executed it. This time I wanted to stick to my guns. Well, with the funky silver ano Luxy Bars, I wasn't able to utilize some options, like bar end shifters, even though the Luxy would accept them. the odd ball angle of the extensions would make bar end shifters stick out at a goofy and exposed angle. STI shifters also would be weird. Doable, but strange. 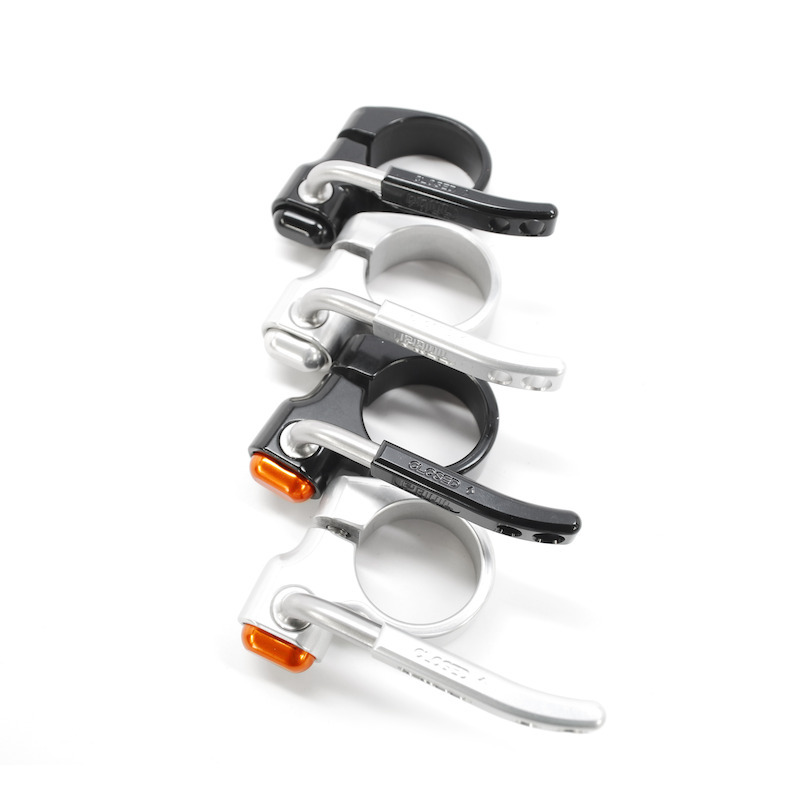 So, I kept coming back to Gevenalle shifter/brake levers. Once I decided on brake type, I got in contact with the Goats there and they suggested the "long pull" version of their Audax option. It came with silver blades and blank mounts for adding your own bar end style shifters. I happened to have a set of 9 speed Ultegra bar end shifters, so I decided this was the option I would go with. Now that I have that hurdle jumped, and the levers are here, I can begin to draw this project to a temporary close. I say that because I still want to do something different with the wheels, but as my ideas are expensive, I am going to go with a set I have here. They are black, and I have WTB Nanos to go on there for the time being. Plans......bah! Why bother with 'em! Forget all about the posts about bike choice for the Renegade Gents Race from earlier in the week. There have been a few things that have happened since then that has changed my mind, or forced my hand. Yeah......forced my hand, that's more like it. There will come a time when I can be more forthright about this, but let's just say that for now I have something on the Standard Rando I cannot talk about or show. The Raleigh has too skinny a tire on it for all the rain we've had. The Black Mountain Cycles rig has a big tire, fenders, (might be handy with all the wetness and a chance for showers Saturday), and something I just got in that I need to test ASAP. So, there ya go. I am taking the bike I first used at the Gents Race and it should work just fine. Plus it has the front bag to stash extra clothing in which may need to be necessary considering the forecast. Cold in the morning and warmer in the afternoon. I may be needing to shed something along the way. Stay tuned for a ride report on Monday. Okay, that's a short one. I will be out till Monday. Have a great weekend and ride those bicycles. What if a six turned out to be nine? Well, be that as it may, I cannot let that bring me down. So I have enlisted help where necessary and the rest I try my best with. Mileages, time cut offs, roster numbers, costs for stuff, t-shirt size numbers. Numbers, numbers, numbers! Then there are the number plates. These are super important. They are what enables my volunteers to keep track of your coming and going at checkpoints, so scoring can be accurate, and we have a handle on how many folks are still out on the course at any given time. It is the number you use to call in a DNF with, and it is the number, should you be lucky enough to finish, that we need to record a finish time with. I have used, off and on over the years, these "Olympic sized" Tyvek numbers meant for track and field events. They were found in a box at the shop where I work at. Since the shop doesn't put on races, and these numbers were just sitting around, I got to using them up. Well, I've depleted the supply. I am about a 1/4 of the total roster number shy for this year. So, I purchased a 100 new ones. Just like the old ones. Greg Gleason exhibiting proper number plate placement. Don't pin your number to your jacket in the morning. Why? Because at some point you'll get too hot, take it off, stuff it into a frame bag or hydration pack, and guess what? My volunteers do not have x-ray vision, that's what. Don't modify your number plate by cutting it away, folding it, or by trying to be all aerodynamic. This will get you into a DQ pickle right quick. Just pin it on like everyone else does and you'll be fine. Pinning the number to a hydration pack is allowable, but do a good job. If it flies off and you don't notice, guess what? You won't get scored anymore. Call it a "nature's DQ", if you will. Take that and make decisions based on that in regards to your number placement very carefully. If there is room, you can pin your number on the side of a frame bag or trunk bag, as long as the number plate is not modified in any way. Again, make sure it is secure and that you will not lose it. Finally, I want to add that while some may see this list of "numbers rules" as a bit Draconian, I am doing this to make the job for my volunteers easier. They are doing this for Trans Iowa, and for you, for nothing other than a "thank you" and for the experience. Don't make the experience a lesser one by messing up with your poor or modified number plate placement. That will not be seen as something "good". Make sense? Be cool! Brooks Cambium C-17 in Natural. Brooks saddles were traditionally made in leather for well over a century, have been lauded and hated on, and are still one of the most iconic bicycle components ever made. Maybe even the most iconic. Traditionalist, tourists, and hipsters have all been fans of the Brooks saddle over the decades. But with all of that, there was one thing that was a big issue. Moisture. Brooks saddles are not really very moisture friendly. They can stretch, crack, and get all sorts of issues if you get them wet on multiple occasions and do not fastidiously take care of them. I have had Brooks leather saddles on other bikes, enjoyed the heck out of them, but I would never have put one on any of my gravel bikes or Fargos due to the problems Brooks saddles have with episodes of wetness. The comfort was there for me, but the durability without doing much maintenance was not there. The C-17 in slate- Fear not the water! My friend MG decided he had heard enough good things about Cambiums that he would pop for one. They are an expensive saddle, so it was a risk and it very well may not have worked for him. However; at the time folks were snapping up used ones in an alarmingly short amount of time if they became available, so he knew he could flip it if need be. Well, as he told me later, he was angered by the Cambium. You see, he liked it so much he wanted four more! That was a costly try out! Eventually, he did get four more C-17 saddles to outfit his fleet. So, I trust his opinion to a great degree, and I decided last Summer to give a Slate colored C-17 a flier on my Standard Rando. I had the saddle on the bike by mid-summer and have been using it off and on since then. Cambiums are made out of a textile and bonded to a natural rubber base which is stretched out over an aluminum frame. The materials are different than a traditional Brooks leather saddle, but the basic idea of the design remains. The rubber base acts like the leather, like a sort of hammock, and the aluminum frame is much like its steel counterpart in the leather saddle. Besides the materials, the Cambium differs in that it can withstand being very wet without having to be carefully maintained afterwards. A big plus for bikes that might see muddy roads, rain, or even wet snow on occasion. Body moisture in the form of sweat can deform a saddle made of leather as well, but the Cambium also is not affected by sweat in the same manner. Okay, that's all just great, but was it comfortable? At first, I wasn't so sold on the Cambium. The base was stiff and not very forgiving to my body movements and bumps from the road. However; after about three good two to three hour rides, the saddle came in and was a completely different experience. The base was forgiving after this, and now it is one of the most comfortable saddles I have ever ridden. Obviously, the shape also agrees with me. One final thing. The comparison to a leather Brooks and the Cambium. In my opinion, there is a "sweet spot" on a leather Brooks and you don't have a whole lot of fore and aft "wiggle room" before you get to the rivets or a spot that is uncomfortable in some way. With the Cambium, I feel that this is far less of an issue. I'm not sure if that is due to how the Cambium's undercarriage is different or not, but I suspect that this is the reason I find that I can move around a bit more with comfort on a Cambium saddle. Would a Cambium work for you? Heck, I don't know. I just know that they work for me and I bought a second one based upon my experiences. The Renegade Gents Race v7 is happening this weekend. Yes, you know that it is one of my favorite rides of the year. Well......you do if you have been paying attention here. So, like any other year, I have to decide which rig to pull from the Lab for duty. The last few years, I think, I've been using the Raleigh Tamland Two. I've used a Vaya I used to have and my Black Mountain Cycles "Orange Crush" in the past. I could use the Twin Six Standard Rando as well. Right now the Tamland is running a strong first for the choice and the Standard Rando is a close second. I recently swapped out the saddle on the Tamland and man! Why did I not just go with what I knew all along and stick a WTB Pure V on there in the first place? I don't know. Sometimes I inexplicably try odd things because......well, they might work. You never know until you try, right? Uggh. Then again, you could be wasting time when a great solution already exists. It's a saddle. Don't mess with what works. So, then there is the issue of having to wrap up the review on the Gevenalle HYDRAULIC components, and what better way to do that than put in a metric century within the context of a race? The downside is that the roads of the Gents Race call out for a tire that is a bit wider. I have 37's on the wheels on the Tamland currently. The Standard Rando has 650B X 47's. I know those wider tires could be a game changer. 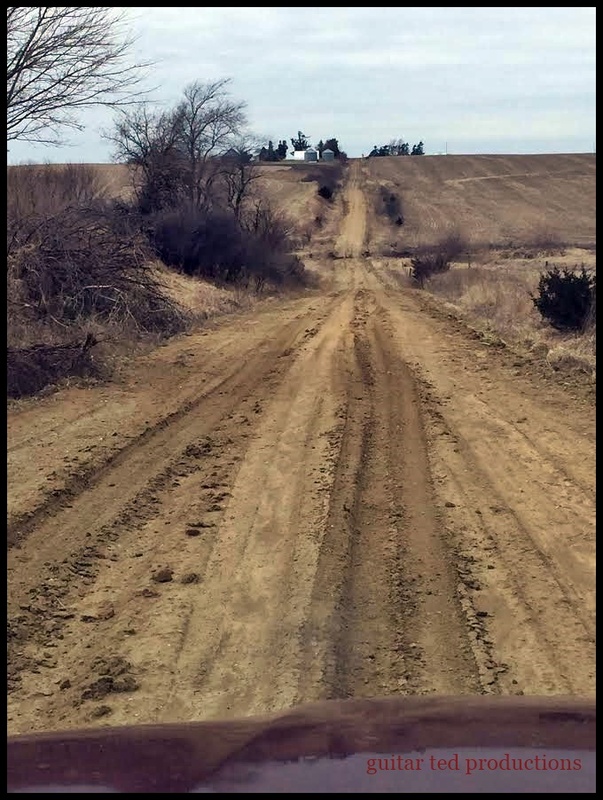 The sandy gravel in the area really can be a bad deal, especially if the maintainers have been out and about. Then there are the occasional fresh gravel dumps which make wider tires a better deal as well. This could also be the look for the weekend. Then there is the lack of miles. This could erase any choice of bicycle. I just haven't had opportunity due to illness and weather to log in any longer rides so far this year. Not that this is anything new running up to the Gent's Race. Many years I have been in Texas a week or so beforehand and/or doing Trans Iowa stuff, so getting miles in March has never really ever worked out for me. At any rate, I should be having a good time, and for the first time I won't have to wake up at "dark-thirty" to get my carcass down there on Saturday morning. This is because my family is joining me and coming down with me on Friday evening so they can all go to Tacopocalypse and gallivant around Des Moines for the day. So, I actually may even be rested this time around. There is a first time for everything! If you believe the hype, this is what will "save" the bicycle industry. I have been reading a lot of news of late concerning how far off the business of bicycles is and has been over the past year plus. It isn't just a little off either. It is waaaay off. Like double digits of percentages off. Yep, these are the bad old days. It doesn't look like they are going to get better anytime soon either. Oh, and by the way, this isn't relegated to just the bicycle industry either. Many segments of retail are down over the past year as well. But I'll just keep the focus on bicycles for this post. I just wanted to point out that you may be hearing "loud sucking sounds" elsewhere in the economy. So, I am thinking that while we know businesses are down, I have noticed something else on the rise over the past year or so as well. That being how many oddball, strange ideas are surfacing claiming to be the greatest thing since sliced bread. It started out with a few categories and products, but of late, it seems that things are getting really weird. You could argue that a fat bike based cargo bike is another big reach for the industry, but this is Surly after all! The industry is in what appears to be desperation mode. The proliferation of gravel everything is one such indication. There is no denying that gravel events are one of the only growth segments in cycling today. More people are doing more events on gravel every year. The industry is trying to cash in. Gravel specific clothing, (yes- it is a thing), suspension forks, dual suspension gravel bikes, gravel wheels, tires, and on and on are being shoved digitally down our eyeballs at an ever increasing rate in response to the rise of gravel riding. But that isn't the only thing, not by a long shot. There are more oddball ideas than you can shake a stick at. Mountain bike specific bell mounts, bent wire saddle suspension that relies on how fore and aft the saddle is set to accommodate rider weight, electric bikes that look more and more like motorcycles than bicycles, and there are more. 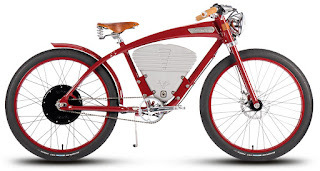 So, if it seems that the bicycle industry has lost its mind again with some new idea, standard, or bizarre product intro, just remember, they need to find a cash flow solution and fast. Otherwise we may see a lot less of even good ideas in the future. This downward trend cannot be sustained much longer without a lot of collateral damage. It Depends On The "How You Do It"
Many folks hear that, or read that, and the hair goes straight up on the neck and the claws come out. If you are one of those folks, I urge you to calm down and come back to this later. There isn't anything here to get upset about, really. So, if you are still with me, there is going to be a Gravel Nationals, and there are going to be "National Championship" jerseys, and the whole deal is being done by the USECF which is a sanctioning body. Now, I'll admit, when I got wind of this, I was very skeptical. Who are these guys? I had never heard of this organization before. Well, as it turns out, the reason why I had never heard about the organization was because the USECF is all about adventure racing. So, how in the world does this organization get into gravel event production? Great question. I actually spoke with one of the board members of the USECF for the "Riding Gravel Radio Ranch" ( Click that link for the podcast) and I got a chance to hear firsthand about that. I encourage you to check it out and listen for yourself. I'll just say that I was impressed by the similarities between the adventure racing community and the gravel racing community. The way the events are nurtured, the spirit behind what they do. It all hearkens to how I feel about and have experienced the gravel races I have been at and have facilitated. Once I knew "the how" of what the do, and why they wanted to keep things that way, I was 100% more comfortable with the whole idea of the USECF putting on a "Gravel Nationals". If it wasn't a rock, it had a spike sticking out of it that could rip yer flesh open. 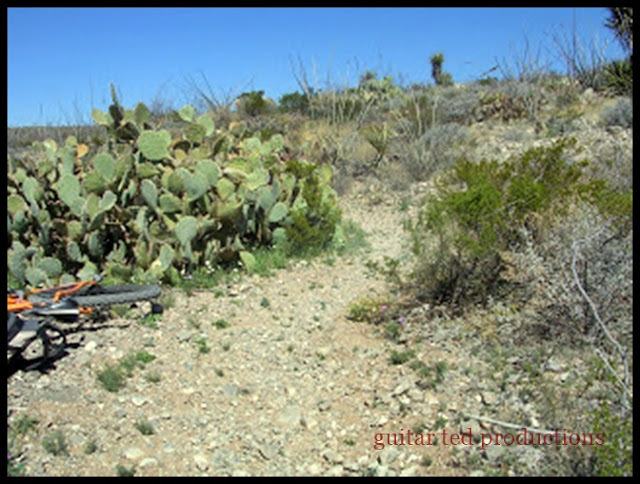 Ten years ago on the blog here I was relating my experiences riding in the Franklin Mountain State Park in El Paso, Texas for the first time. It was, understandably, an eye opening experience for me. By this time in my life I had ridden a mountain bike in Colorado, Wisconsin, Minnesota, Illinois, and all over Iowa. But I had never seen rock, rock, and more rock like I saw in El Paso. It was unbelievable. I was overwhelmed by the experience of riding in the desert. The bike I used was the Dos Niner, and despite the fact that it maybe had 3/4's of an inch of rear travel, I was super glad it had some travel! I remember slamming into a wash so hard I thought the bike should have broken in two pieces. Amazingly, the Dos held up and so did I. I also found out I was way out of shape, but I think I cleaned more than I should have just on pure adrenaline and the excitement of riding in a new place. I certainly came away with a new appreciation for El Paso and mountain biking in general. It made some things I used to think were tough into child's play. In fact, it kind of spoiled me that way. There aren't too many places I have ridden since then that even come close to how hard it is to ride those trails. Going steeply up on loose, huge sized gravelly rock, snaking your way through a minefield of thorns. 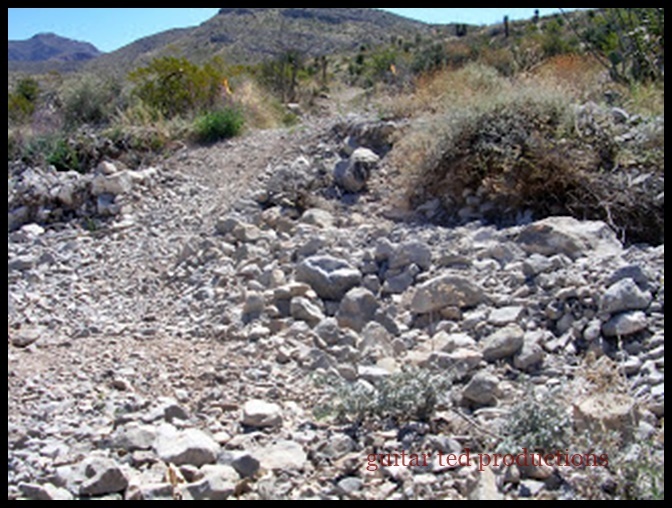 Typical El Paso trail. While all that was exciting and fun, I had to turn my attention forward to Sea Otter and beyond that, to Trans Iowa v3. Jeff was mostly out of the picture, but at this time ten years ago I still didn't know for certain how little or how much he was going to be involved. Then there were some bizarre requests to photograph the event from oddball folks I never had heard about, all of which I eventually turned down. There also was another, strange, unbelievable request from a guy from Portland, Oregon which I had to field as well. See, this was a huge transition for me, and I was going through it ten years ago, and I was not at all comfortable with this. Originally I was just Jeff's helper, a "gopher", the route maker, and I facilitated Jeff's desires in how to run things. But here I was with Jeff absent most of the time and me having to field all the requests and questions that Jeff would have normally handled himself. Now I was becoming the "director" of Trans Iowa, only I wasn't really seeing it that way. You could say that I was in denial. Anyway, this guy from Portland was an author and he kept e-mailing me and calling me with all these questions. He was getting an "advance" from a publishing company to write a book about underground, under the radar sporting events. He had heard about Trans Iowa from Ira Ryan, who was starting out as a custom frame builder in Portland at that time. Ira won the first Trans Iowa. "In the end, Jeff and I run the thing and put it on. It's up to us whether or not it is what it is.......for now. I suppose if it gets away from us for whatever reason, we can always shut it down. Are we part of a revolution? Ahh.....well, maybe. I think history, or maybe this upcoming book, will be the judge of that. All I know is, we want to ride our bikes for crazy long distances self supported, and we think you do to. As long as we have that basic understanding, then we have things like Trans Iowa. If that's a "revolution", then so be it." The Terrene Honali 700 X 50 tire. 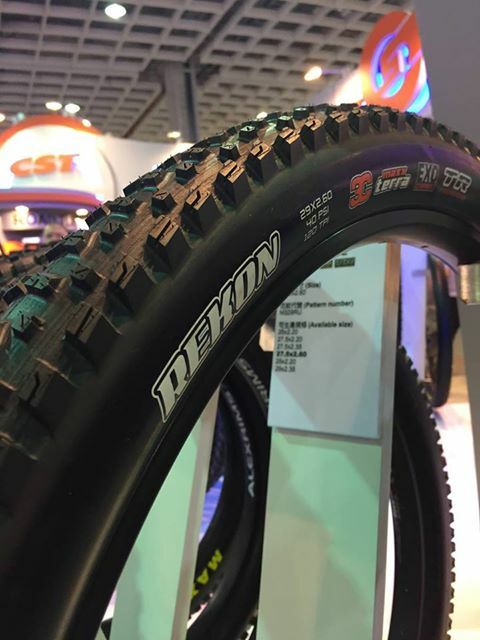 Terrene Tires has made quite a splash with the three tires that they entered the market with last year. 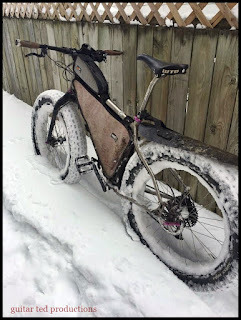 The mtb "Chunk", the fat bike specific "Wazia", and the gravel oriented "Elwood". I have the Elwoods and I think they are as good a gravel tire as you'll find. Well, however the name sounds, the tire looks good. Maybe not exactly what I had in mind, but we will have to see about that. There is a reflective sidewall, which I think is cool if you do anything late evenings or at night. Some folks don't like that reflective stripe, but it never bothered me, and it could save you from getting hit. I like that idea. I was thinking a bit about tossing on a set of Surly 700c sized Extraterrestrials, but those tires are heavier ( reportedly over a 1000 grams each) and burlier than I think I need. Great tire though. Love the 26"er version on my 1X1. I just feel I don't need that big brute of a tire on my Fargo. I don't think I need all that flat and sidewall protection, for one thing. Maybe the Honali will be similar but not as beefy? That's what I'm hoping to find. Resurrect your decade old FS 29"er as a "full suspension gravel device"! 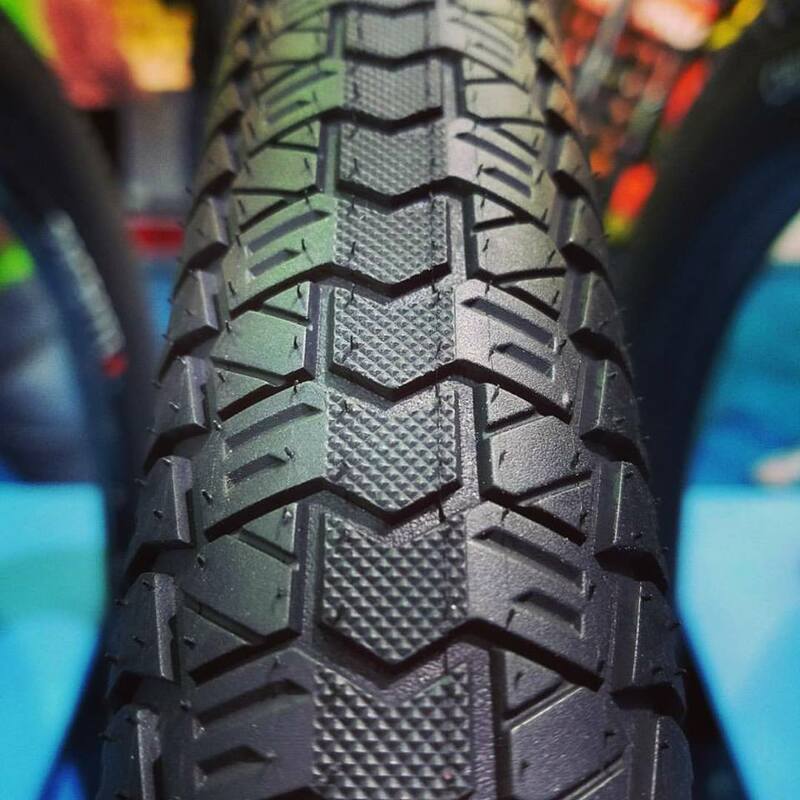 Another Taipei Cycle Show find was news concerning the showing of a "full suspension gravel bike". No, I am not making that up. Go ahead- click that link. I wish I were making it up, but it is apparently an idea being floated in Taiwan which I am sure some company is hoping will catch on. Ya know, I hate to break it to them, but there are these devices called full suspension 29"ers out there that are already doing the same thing they want this bike to be doing, only they do it better. Heck, I bet there are a lot of decent, first generation full suspension 29"ers out there that would be had for a song that you could actually use as a gravel bike. Well, actually I don't have to bet. People are already using those bikes as gravel bikes. I saw a few last Summer at Gravel Worlds, as a matter of fact. So, yeah........I happen to still have that Fisher HiFi in the image here, and I think I might just go right ahead and try this myself. I mean, why not? A set of lighter disc wheels, a nice set of tires, a Jones Bar, and BOOM! I even serviced the fork for this recently. Like I need a new project, but again- why not? Stay tuned for a post dealing with my experiences on dual squish bikes on gravel and how this Fisher might work out coming soon. 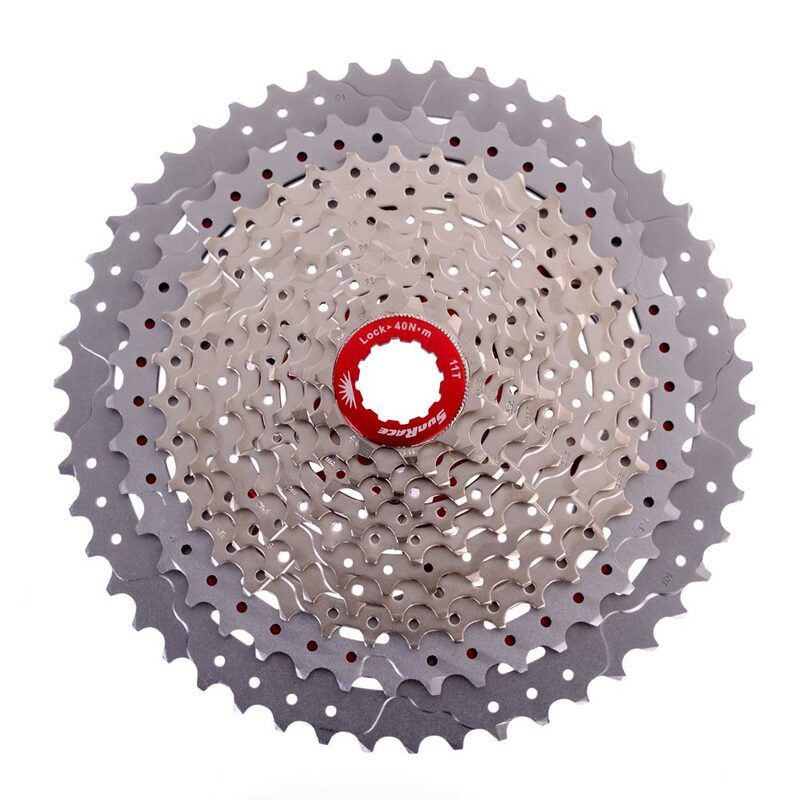 First SRAM comes out with Eagle 12 speed and says this is the best wide range cassette 1X option you can buy. Well, is it really? Sun Race makes a case for their 11-50T 11 speed cassette which slides on to a regular splined free hub body and costs a heck of a lot less than SRAM Eagle. Plus, if you already run 11 speed mtb shifters and derailleurs, this is supposed to work fine with those components. The image here doesn't do the scale of this cassette justice. Those big cogs are ginormous! My gravel bikes don't have chain rings that big! I guess this puts SRAM on notice that, for many of us, if we are going to pop for something along these lines, the value per buck spent is going to be tilted in this cassettes favor more often than not. I mean, you don't have to have a specific SRAM wheel, you don't have to have SRAM Eagle, and you don't have to spend a ton of money to expand the gearing range on your 1X set up. That is, if you are into such a thing. I still think 1X is a flawed system that compromises chain line, increases wear, and has gearing steps which hearken back to 6 speed mountain bike freewheels. My opinion is that human powered mountain bikers will someday realize that maintaining momentum and cadence is easier with close ratio gearing set ups. But then again, maybe I am a dreamer. A tire for skinnier rigs- WTB's new 32mm Exposure. One more bit that was just released news this week- A tire from WTB to join the currently offered 28mm and 34mm Exposure line up. This one is the "Goldilocks" 32mm size. Many folks may not realize it yet, but many disc road bikes can take 32mm tires with ease. This might make your roadie rig, (if it is a disc road bike), something more adept at smooth dirt roads and maybe even some finer gravel. (Looking at you, Southeastern Minnesotans!) I like the idea of that, but in practice, at least around here, a 32mm tire is not going to work. Yes, I have tried it. Even 30mm tires, actually. When you find that gravel that has been swept cleanish of "real crushed rock" and has that fine, hard, gritty limestone base showing, then heck yeah! 34mm or even 32mm tires absolutely are a blast to ride. Or you could cruise alleyways. That gravel is pretty tame. However, you aren't going to find miles of unbroken stretches of that in Iowa. On the contrary, you are more likely to find miles and miles of deep, fresh, chunky gravel, which would make a 32mm tire a big chore to ride, and super unpleasant to experience. So, I like the idea of the Exposure, and maybe it would work where you live, but it doesn't go far enough for me. I'll stick to my 37mm Riddlers and other, bigger, supple, more capable gravel tires here. Okay, that's a wrap for this week. Have a good weekend and ride yer bicycles! A Rock Shox Judy?! Yes, a new Judy is coming soon. Blast From The Past- Only New! What better way to kick off a "Throwback Thursday" than to talk about yesterday's news that a new Rock Shox Judy will become available as an aftermarket and OEM suspension fork for 27.5" and 29" bikes. 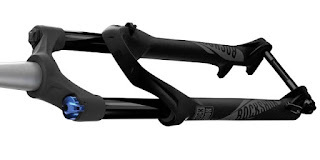 SRAM marketing mentions something about "entry level" bikes getting this nicer fork, so take that under advisement. It seems that it has decent features, and with the 29" Boost version, you can go with 27.5+ tires. Of course, all of this Judy gab is really a distraction since Rock Shox also announced several updates throughout their fork line up. You can catch up, if you care to, by checking in with our UK based dirt heads here. First there were 29"er tires, then this whole thing went nuts with fat bikes, "Plus" sized 29"er tires, and 27.5+ stuff. I'd heard rumors that a category of 29"er rubber was going to be made in that empty space between current 2.5" tires and 3.0", "plus" sized 29"er tires. Well, it seems that 2.6" is the size we will see first and Maxxis is showing a tire at the current Tapei Bike Show happening now. There will be a lot more of this sort of thing, so that begs the question: "What bikes will they fit and when will we be seeing them?". 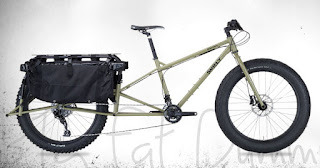 Obviously there are already a few rigs out that are 29+ that this would work in, but I figure we will start seeing some real burly, front and full suspension bikes that utilize this size tire and will not be full on 29+ bikes. After having spent a lot of time looking into and riding on various 29"er tires over the years, it is plain to me that to make a tough tire that has decent knobs that won't wilt at the sight of rocks and what not, you are talking about adding a not insignificant amount of weight. This means that those flimsy Surly Knard 29 X 3.0's folks often slag on because they cannot handle rocks and things of that nature would weigh far over 1000 grams each if they did have a tougher casing. And that is without adding rubber tread blocks. This is why the Dirt Wizard is "undersized", because if it were a big casing with all that rubber on it the tire would weigh as much as many fat bike tires do. 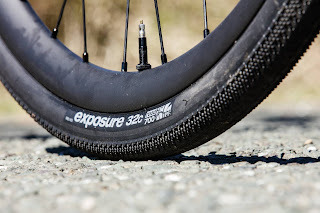 I've believed all along that 29+ was just a bit "too much" in terms of dimensions and weight to become a very widely acceptable wheel/tire format. The numbers there will always be small. This new aim at making a tire with a 700c bead seat diameter and a 2.6" width has some legs, I think. It keeps all that weight and diameter in check, to a degree, and I think it is just enough to make it more appealing than full-on 29+ (three inches or larger) wheels and tires. I don't think 29 X 2.6 is "plus"sized, but maybe it is "husky"? Well, whatever it is, I like it. Eventually my Singular Buzzard will see that size tire on it. It will get the job done. Parts bin parts are sometimes a good thing, and then again sometimes they can be a curse. I mean, what the heck am I saving this stuff for? Then comes a day when you find that part that allows your build to continue forward and you think you are a genius for saving all that stuff. Most of the time though, it is stupid and a burden. Of course, there are those bits one should never toss out, like good 8/9 speed derailleurs. I had this old 90's era XT derailleur hanging around and I decided to employ it once again for the rebuild of the custom rig I have here. You might remember the post about the chain rings from last week? Yeah, that bike build. Anyway, I have found the derailleurs for the build. The front, a shiny top pull XT, is likely the one from the original Fargo. I'm not sure though. It had a clamp that fit the fillet brazed frame I am building up perfectly though, so whether it was from a Fargo or not, it was likely a steel framed mtb of some sort. Parts bin parts, ya know. Their origins are sometimes murky at best. The rear derailleur, well, I think I know the story here and the blue, sealed bearing jockey wheels are my clue. 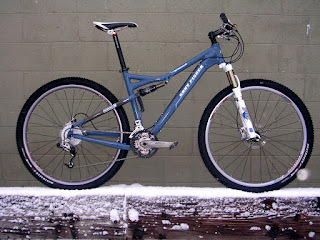 I had a 1996 Diamondback V-Link Pro dual suspension bike and it was an XT equipped rig. I remember it had a raw aluminum/blue theme to its look. 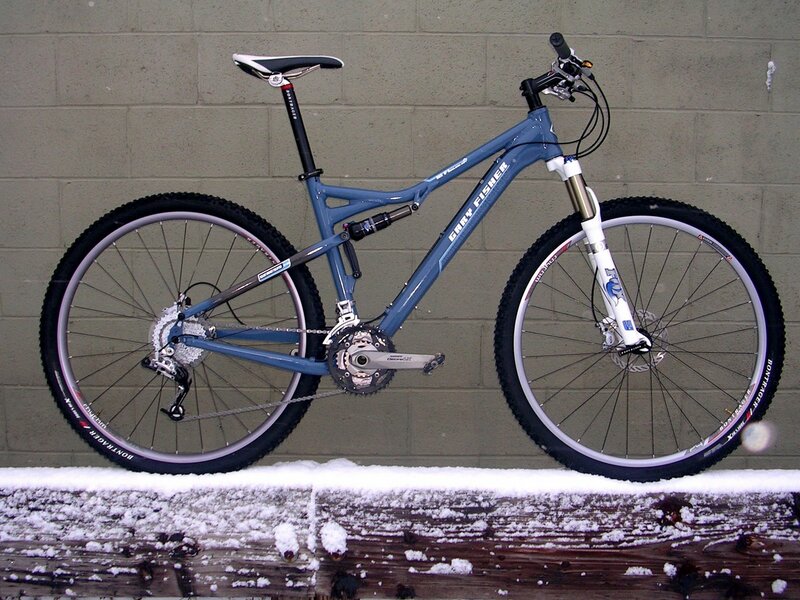 There were the blue grips and matching Panaracer Magic blue treaded tires. Not really blue rubber. It was so dark you almost could mistake it for black, but it was definitely blue. At any rate, I decided to swap in more blue anodized bits and these jockey wheels would have been something I would have done back then. So, I think this rear derailleur was from that Diamondback V-Link Pro. Most likely, it was. Blue jockey wheels don't really go with the theme of this build, but the nostalgia for me carries the day and this will be the part I use. I suppose if I really am offended by the blue I can swap out to silver sealed bearing pulleys easily enough. 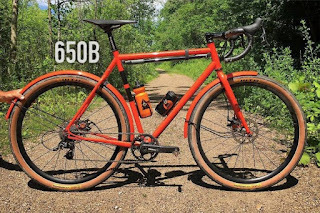 650B Gravel Bikes: Are They Mountain Bikes Too? Okay, here we go folks. Just to reiterate, this is only my opinion. The industry is making so-called "gravel bikes" which are dual-wheel size compatible. These are the "latest" thing now. The entire genre probably got its start with Open's "UP" model. Once that bike made a big splash it didn't seem to take long for others to follow suit. This is the gravel bike "du-jour" of 2017-18. Most will be made of carbon fiber, but I've seen aluminum and steel models too. Big, chunky carbon forks with through axles will be on the front, disc brakes all around, and typically these sport shorter chain stays to appeal to the roadies out there who think longer than 425mm chain stay lengths are "unresponsive". There are a lot of announcements, but not much in the way of details, and even less in terms of ride reports. The one thing all of them tout is the ability to run a 2.1' X 650B mtb tire. This seems to be just "accepted" as being a "good thing" by all who have reported on these bikes. However; I don't think it is so much a feature as it is a marketing tool to get you hooked up to buy one. Yes, I have tried it, as a matter of fact. Before I get into that though, I will say that I do totally buy in to using a 650B wheel and a tire suitable to gravel riding, and for using that to actually ride gravel roads. What I have found is that there are certain benefits to running a light, supple, high volume tire tubeless on gravel roads with the 650B size. There are other benefits that 700c brings to the table that this 650B wheel size does not possess. But that said, both have their place. While one could do whatever the heck they want, and run a heavier, knobbier tire and call it a gravel bike, I don't think this is what the marketers mean. I think what they mean is that your gravel bike can be a mountain bike. So, leaving the gravel stuff aside, let's take a look at what makes this a not such a great idea. Okay, here's my take. When you eat steak at a restaurant, you could use a table knife to cut yourself a bite to chew. It is a knife after all, and why shouldn't you be able to use a knife for butter when eating steak? Well, I don't know about you, but when I eat steak, I like to use a steak knife. Just like when I mountain bike, I roll out a mountain bike, not some small wheeled, kinda knobby tired, drop bar bike. Why? Because one tool is better for the job than the other is, that is why. 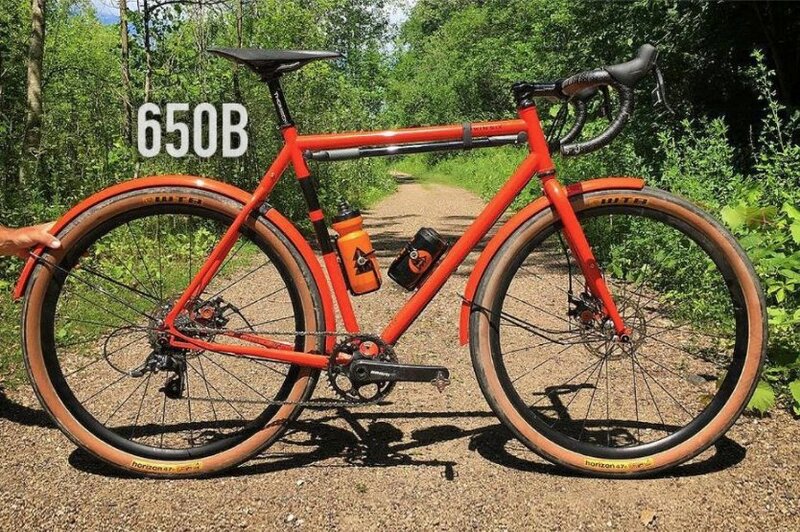 Again, you can do whatever you want to do, but my point is that marketing these 650B/700c "gravel bikes" as do-it-all bikes that could be a mountain bike isn't reality. For someone, or two, or maybe three of you, yes. It will be that bike. For most folks that buy in to the idea, they won't be satisfied. 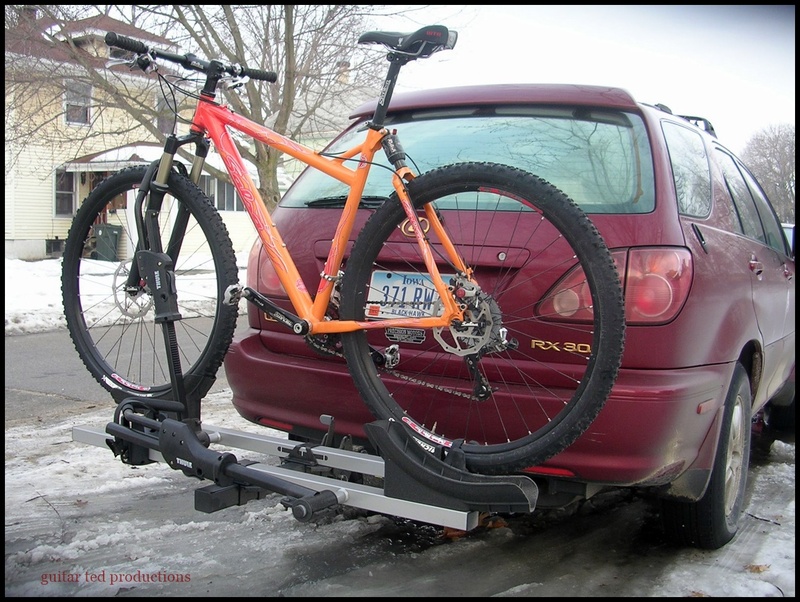 They won't be satisfied because, if they have ridden a mountain bike, they will quickly realize that road-ish geometry and road bike positioning, which most of these bikes have, isn't an ideal solution for mountain biking. So, I am totally not buying this malarkey about using these super-designed, gravelly bikes for mountain biking when they are the furthest thing from what reality in mountain biking is these days. Not for most people, it isn't reality. Again, there are exceptions to every rule, I get that. But that said, these 650B gravel bikes are not mountain bikes too. Riding the Great Plains looks easy, except you cannot see the wind here! Saturday I planned on doing a longer ride. This would be the first planned longer ride since I have (mostly) recovered from a nasty head cold. My nose was still runny, but otherwise I felt fit and good to go. The weather was not ideal. The temperatures were in the mid-30's and the wind was stiff from the Northwest, but I have gear for that. No excuses! I didn't get headed out until after the hair cut and some lunch. Before that I changed something on the Raleigh Tamland Two. I had gotten a hold of a WTB Pure V saddle from my friend Tony, who I believe got it when he purchased his used Fargo. At any rate, this replaced a fizik saddle that was okay, but it never really felt good. I knew that Pure V's were good on drop bar bikes like the Tamland because I use one on my Black Mountain Cycles "Monster Cross" bike and I love it. So, I figured why fight it by trying anything else, and so I just decided to go with this Pure V for the Tamland. The Tamland Two with the WTB Pure V now mounted. So since the wind was out of the Northwest I decided to do a loop that took me East and then North out of town. It is a loop I generally never use unless it is early in the Spring. This is due to the fact that it starts out with miles of flat- really flat- terrain. It is good when you aren't sure where you are at with fitness and you just want to get some miles in. On Saturday, the opening stretches were with the mighty tailwind, so it was fairly easy to get settled in before I had to get working and go North. There was a stretch which was flanked on the South side by very tall Evergreen trees. I happened to notice something moving high up in the sky, coming from behind these trees. It was a magnificent Bald Eagle, soaring across my path diagonally. I thought that was really cool, and my eyes tracked it as it moved to the Northeast, seemingly untouched by the winds which were strong then. Suddenly, I noticed the Bald Eagle had company! But there were seven in all. There ended up being seven of them in all. Bald Eagles are not rare by any stretch these days, but it is odd to see them in such numbers in mostly dry, flat territory. I've seen the odd single eagle sitting in an open field at times, but this was a spectacle that I was blessed to be treated to. After a bit of marveling at them, I decided I had better push on. 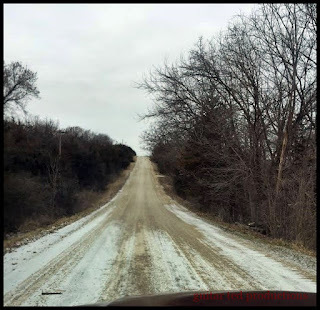 Here is where I turned North, on Pilot Grove Road. I turned North and into the head wind on Pilot Grove Road. Thanks to my friend Tony, who lent me a book on early Native American, Pioneer, and settler's trails in the area, I know now that Pilot Grove Road got its name because at the time of the first settlers coming to this area, there was a Native American trail that cut Northwestward through here that used an isolated grove of trees as a "pilot", or guide", to navigate the wide open grasslands of the day. Of course, no one knows exactly where the grove was, but as I turned North, I would like to think it was along Poyner Creek in that hollow off in the distance where trees line the waterway to this day. I have done some other research into the area, but nothing has turned up and I may never know for certain where the old grove once was. The wind was giving no quarter and I was working the bike hard to maintain 10mph. Of course, you cannot hear anything but the roaring of the wind when you are headed directly into it, or nearly so. This is another thing one has to train for because I feel that this wind noise is a natural deterrent to your mental drive to carry on. It wears on you mentally, and it is easy to let yourself get discouraged by that noise. I try to think about other stuff and it works, mostly. That is until your legs ache and belly aches to the point that you must stop to address those needs. That I did. A flattened banana and some water to wash it down and I felt a lot better. Then it was off Westward on East Bennington Road. I had a plan at this point to tack the wind by going a mile West, then a mile North, and so on till I reached the county line. However, a turn North on Ordaway Road led me to a "T" intersection with a busy paved county road. Bah! 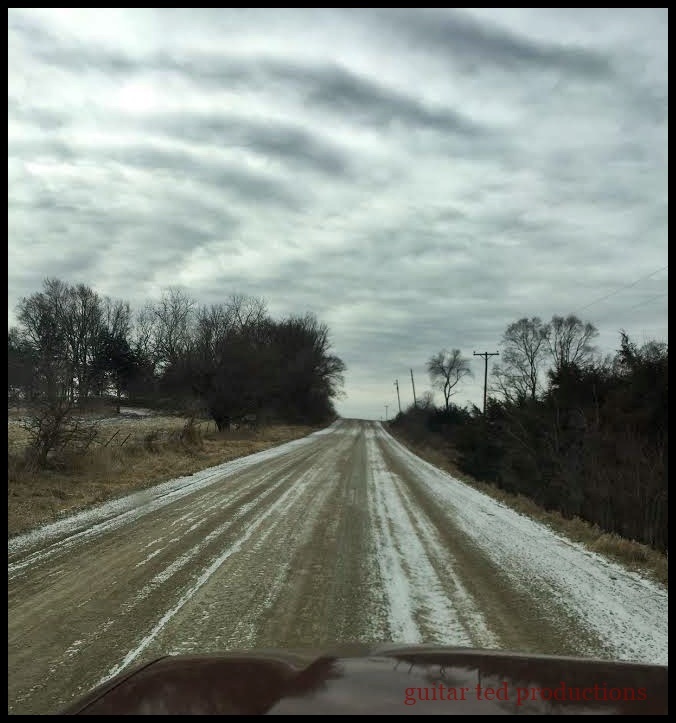 A mile West and an intersection with another paved road! Okay, back South to Bennington then, and off West once more. No more pavement! Crossing Crane Creek on Bennington Road. Okay, now I was headed back into familiar territory once again. The way Westward didn't seem as arduous as it had been going North, so this was good, although my legs were barking at me. I knew the truncated course and plan was probably going to work out for the best on this day. Too much too soon and I would run the risk of getting sick all over again. Oh yeah, I found another country church. St. Francis Catholic Church on East Airline Road, just off Pilot Grove Road. This dike and emergency spillway are a flood protection for North Waterloo. Located near Moline Road and Airline Road intersections. The Pure V saddle worked great because I never noticed it at all during the almost three hour ride. So, I think I have finally arrived at the two saddles I can ride on gravel bikes now- WTB Pure V and Brooks Cambium C-17's. That took long enough to figure out! Hopefully this will make for a good base to get up to speed to do a metric century with my teammates for the Gent's Race on April 1st. I don't have much time! 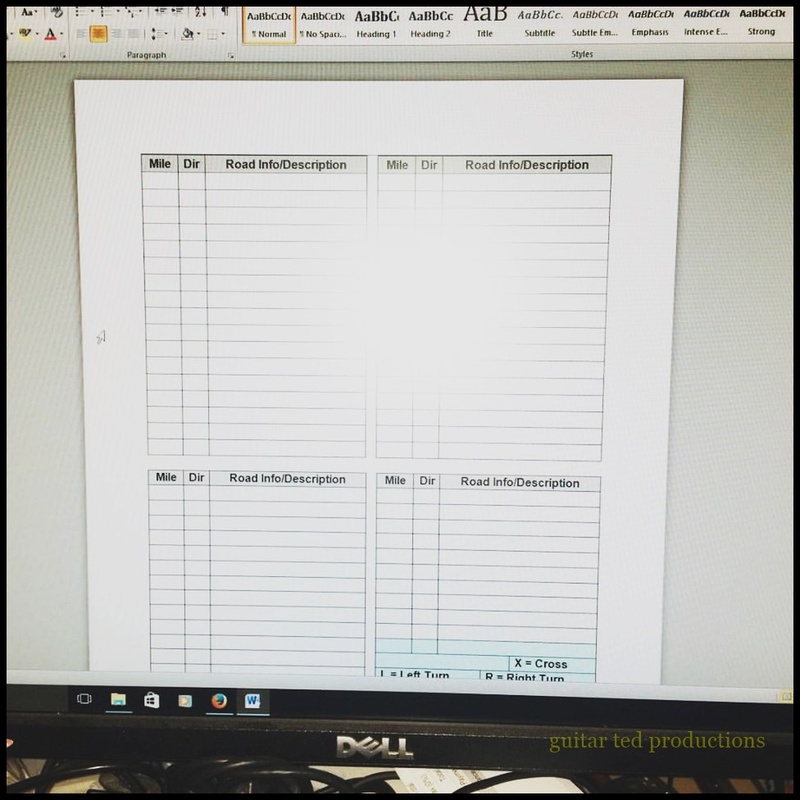 It is that time of year again for me to go over a few notes on the cue sheets and point you back to some previous posts that explain how I have done cue sheets since T.I.v8. The first thing you will notice is that no one else does their cue sheets in this way that I am aware of. Most events that still don't cater to the "I gotta know the course ahead of time" crowd use the "tulip style" cues, which are fine, but I didn't have that format back in the day. The format I came across is what I have used since the early days of Trans Iowa and I have just refined it and made it a staple of the event. While I am on the subject of courses and how many events do things, let me just say that "no- I won't offer GPS files and never will." That isn't at all what Trans Iowa is about. Unless you earn all the cue cards, or finish the event and have recorded it on your personal GPS unit, (which- yes- is allowed) there will be no record of the course in the future. For instance, there is no GPS of the T.I.v11 course, since the furthest anyone got was 128 miles that year. Yes, I have that course, and no, you cannot have it. I hope that is all clear. Anyway..... Read THIS POST here about cue sheets and HIT THE LINK IN THAT POST! Between those two links you will learn 98% of what you need to know about the cues and how they work. THIS IS IMPORTANT! You must rely on the cue sheets to navigate, as there is no other way to follow the T.I.v13 course. Get this wrong and I guarantee you will get lost and not finish. Important Note: I have decided that in order to streamline a couple of things, and to alleviate an issue we had with the finish last year, I am going to replace the "n/s" cue, (No Sign), with "Flagged". Here is what this means and what it does. There are a few unsigned corners in this year's Trans Iowa. That isn't uncommon, so what I have done in the past is to use a stake with two neon yellow ribbons tied to it to mark the corner where you are to change direction. This will always be on the right hand side of the road nearest to the corner you are to turn at or where there may be a question as to which way to go. As a rider, you should then look left, right, or straight head. If you were to see a similar stake with two neon yellow ribbons on it on the right hand side of the road as you looked left, you would then turn left. This should agree with your cue sheet. Right hand turns would be indicated by a stake on the right hand side of the road to your right, and odd, "Y" corners, or anyplace where there is an unmarked directional change, would be marked in a similar manner. So, you will roll up at about 123 miles, see a stake on the right hand side of the road with two neon ribbons streaming off it in the wind, and then look to your right. There should be, at that corner, another stake with two ribbons up the road to your right on the right hand side of the road. That indicates that you have found the turn at 123.6 miles on Switchback Ave and you should turn right at that point. It should also be noted that in past Trans Iowas I have utilized bike paths where they made sense. This will be the case again in T.I.v13, so please be alert and pay attention to the cue sheets. Since the paths generally are not marked with street signage at intersections, you will see the "Flagged" notation on the cues to alert you to where there is a change of direction that takes you on or off of a bike path. Finally, the "Flagged" designation will alert you to look for a change in direction where there would normally be no street signage, as was the case at the end of T.I.v12, where the final run in came through the service parking lot of a cemetery. Since those stakes/ribbons are hard to see at night, a designation on the cue may have led to riders seeing them instead of missing them as they did in the case of our first two finishers. The stake.ribbon/signage will all be gone over again at the Pre-Race Meat-Up, but I wanted to get this info out so that riders can consider it now and perhaps ask questions if they have any now. Since there were no pics ten years ago this week, you get to see my old Dos Niner again! Ten years ago this week I was on Spring Break vacation with my family in El Paso Texas. I didn't have the access or skills to post on the road at that time, so I didn't post but twice that week and there were no images. Can you imagine me missing three days in a row with no posts these days? Ha! That would be a weird thing such that if it were to happen some of you would likely start wondering what was wrong with me. 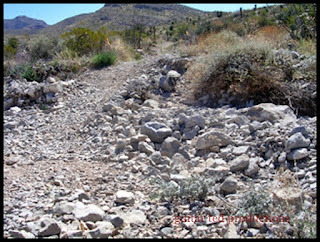 Well, at any rate, this was the week I first rode in El Paso Texas on the Franklin Mountain State Park's trails. It was quite the eye opener, for one thing. I had never ridden trails that were 100% rocks. Zero dirt- all rocks. They varied in size and consistency from gravel to boulders and everything in between. They were loose, shifty, and clinked in a weird way, except for when you were on bedrock. Obviously that wasn't loose. In the cracks, crevices, and in the finer rock grew all manner of prickly Chihuahuan desert flora. I even got spiked by some plant adjacent to the trail which went right through my Sidi mountain bike shoes. I loved the desert riding even though it was super tough. I miss it too. I hope to get back there and ride again soon. Looks like a regular ol' Jones Loop Bar, but the difference is inside. Jones Loop Bars, or as they were in the past, Jones H-Bars, were always a bit pricey. Especially when they were all made from titanium. I always wanted one, but never would pop for that much coin to get one. (Look at me now! A Carbon Loop Bar owner!) Anyway, Jones Bars are weird, and anytime you get into the "weird zone" with cycling components, people tend to get a bit skittish about spending a lot for an "unknown" benefit that may not be real for them. Well, Jeff Jones realized this, I think, back when the whole licensing deal with Titec was in force. The Titec H-Bar sold well enough that I think it caused Jones to debut an aluminum version for his own company eventually. That bar is still over a hundred bones, so Jones found a way to get the Loop Bar well under $100.00. Now maybe you could afford to check out what all the fuss is about. The way they did it was to use straight gauge tubing which adds weight but is cheaper to make. Otherwise it is the same Loop Bar in terms of strength, dimensions, and shape. The SG Loop Bar (SG = Straight Gauge), is $79.00 and available for pre-order from Jones Bikes now. Maybe This Should Have Been Called The Klamper? Just in case you may have missed it, NAHBS, (North American Handmade Bike Show), just happened over the past weekend. There was this whole fuss about Peacock Groove's purple bike for Anna Schwinn, but other than that, the coolest thing, in my opinion, to come out of the Salt Lake City show was the Paul QR Seat Collar. There used to be loads of "chi-chi" items one could buy for their mountain bikes back in the day. One of the bits you might have "upgraded" to some wild, CNC machined, anodized color was your seat collar. Many of these bits and baubles for bikes have disappeared. What is available is usually in the realm of customized urban, "hot rod" bicycles. However; Paul Components still makes a few bits which are either direct from "back in the day" that never went away, or hearken back to such parts. The QR Seat Collar is one of the latter. It retains the cool, machined look of the old days with the modern style and functionality one would expect from a more mainstream component company. In other words, you get style that actually works. At least that's been my experience with other Paul Components parts. For years the Salsa Cycles Lip-Lock seat binder was about the only cool seat QR you could get. So it is nice to see Paul Components offering such a classy yet flashy bit to adorn your sled with. Apparently, this seat collar is offered in purple! I better get on that...... MSRP is $53.00 USD. While I try to disseminate news and updates on the Trans Iowa site, I have found through the years that many times it is best to post stuff here. I can take more space here to get into details, for one thing. That and it seems that it boils down to the fact that as many places as I can post this information, the better chance it will have of reaching the intended audience. So..... The Grinnell Steakhouse has confirmed the date we are to be using their facilities for the Pre-Race Meat-Up. This is the mandatory meeting place if you are riding in T.I.v13. The Meat-Up begins at 4:00pm and socializing and eating is encouraged until 6:30pm. Also- you have till 6:30pm to sign on. Miss this and you aren't riding in T.I.v13. DO NOT BE LATE!! About 7:00pm I'll conduct the meeting proper. By 8:00 we should all be outta there and trying to find our beds to get ready for the 4:00am start in front of Bikes To You in Grinnell. T-shirt order is being finalized and sent in for printing. If you are reading this, and you didn't bother to respond to my post and e-mail I directed at you, and you are in T.I.v13, well guess what? You won't be getting a t-shirt, that's what. There aren't many of you, probably less than 20, but so be it. I cannot be arsed to track you down for a free t-shirt any longer. Have a great weekend and ride those bicycles, y'all! The French Connection for shiny, pointy rings of doom was Peter White Cycles. Another rung in the ladder to the finish of my old custom bike has been reached. The crank set and bottom bracket have now been acquired and installed. Of course, I tried to stick to my plan of keeping it as polished as possible going strong. That meant I had to go to a source that maybe we don't think enough about. The French company, TA Specialties. Old, old school mountain bikers might recall that the earliest Breezers, Ritcheys, and other custom mountain bikes came with TA Specialties crank sets as they were the only thing around one could fit to a bike with triple chain rings and get ring tooth counts which would provide the wide range gearing riders wanted. After the industry caught on to mountain bikes and started making purposeful designs for the activity, TA Specialties fell from grace. Touring, as a cycling activity, also faded from the forefront in the late 80's and early 90's and where TA Specialties held a strong presence was now no longer a focus for the majority of cyclist in North America. Here are the rings with the bottom bracket and my XT crank arm. I am not going to pretend to know how TA Specialties managed to carry on after those days, but I would imagine that they have had good sales in Europe all along. I say this because when my search for silver chain rings led me to this company, I found out that there were 34 pages of choices in chain rings alone! Now, I may not know details, but a company just doesn't make that many chain rings unless they are selling some. I purchased my rings via Peter White Cycles, but I understand that there are a couple of other US importers as well. Anyway, since I had a triple chain ring crank, I decided to utilize all three positions and purchased a 46T, 36T, and 26T Chinook model set of rings in silver. The rings are ramped and pinned for better shifting and they have a beefy, solid feel to them. I was impressed with how well they seemed to be made. I bolted those up to my circa 2008/2009 XT triple crank and then I matched that up with a set of Shimano outboard bearing cups that I filled with Enduro sealed bearings. I also used an anodized red FSA bottom bracket sleeve just because it looks cool and is, well..........metal. I like the way it interlocked in with the Shimano bearing cups better than a plastic Shimano tube does. All bolted up and ready to install. The big, thick tabs on the TA Specialties rings don't quite match up with the lines of the spider on the XT cranks, but that's okay with me. This would really be an issue only if the cranks were black and the rings were silver or vice versa. With both being a similar hue, it isn't the eyesore it could be. So, I am okay with this. I have found that a 46T is a good place to be for gravel travel on flatter roads, so the 36T only gets used on hilly to rolling terrain. That 26T will come in handy when I am on really long rides and the legs are spent, or if the winds are contrary in combination with hills. A "leg saving" bail out gear. It is nice to have that to fall back on. This bike will likely bike a 9 speed rig now. I have a mostly silver XT rear derailleur from the mid 90's that I will likely use here. I also will have to check in to a front derailleur, but obviously those are silver most of the time, so I am not too worried there. I checked in to my parts bin and I do not have a shifter set up. This means I will likely get either a set of bar end shifters, (not the best option with Luxy Bars), or I will opt for a new set of Gevenalle levers. Then there are the wheels. That could get pretty expensive, and I am leaning toward doing White Industries XMR hubs laced to Velocity Blunt SS polished rims. This may have to wait for a bit. So, depending on how things go on that front, I may end up rolling on a place holder wheel set for a time. Most likely I will if the rest comes together well. From Dale Jr's Twitter Feed- Guess who shamed him for his short socks? Cycling is a weird sport. Really, truly weird. I know this because when I fell in love with the activity of bicycling when I was but a kid, it wasn't what I found as an adult. Back then no one thought about what clothes you wore or how you put your sunglasses on when you rode. You just rode your bike and had fun. That was pretty much the only rule- fun! Things got more fun as I got older when I picked up a friend's ten speed bicycle for a bit as he couldn't find anywhere to store it while he was in transition between homes in two different states. During that time I rode his bike along trails and roads I hadn't been on. I often would ride down to hang out at an ice cream stand in a small town, eat my confection, then I would turn around and ride back home. I never heard a negative word about how I was doing all of this. Well, that is, until I started cycling with "serious road cyclists". Those guys I first started riding with on the local training loop weren't friendly. They weren't about teaching you anything, and they figured if you couldn't hang, well then, too bad. Heaven forbid that you wore something wrong, didn't "pull through", or took a flyer when it wasn't appropriate. There was a semi-secret language and all these unspoken, untaught "rules" which made riding with these jerks no fun at all. Ya know, if I hadn't had cultivated a couple of decades worth of "fun cycling" ahead of this group ride experience, I might have just quit the whole deal then and there. I had already spent a small fortune on clothing, the "right bike", and then I got treated like an unwanted step-child by these guys, which was really discouraging. Well, I went and did my own thing for rides after that and never went on another group ride for years. In fact, I still don't do road based group rides. Ironically, Dale Earnhardt Jr just got into road cycling. He has been pretty open about the process on his social media. He says he feels odd wearing Spandex/Lycra outfits. He says he thinks the equipment "necessary" for road riding is expensive, and he revealed that he was shamed for wearing too short socks by none other than Lance Armstrong. He detailed how his first few rides have gone- he got thrown the bird by a motorist and had a flat tire from hitting a rumble strip due to an unannounced sudden move by a seasoned cyclist he was with. That's pretty encouraging stuff right there. Yep! Makes you want to jump right in and follow along, it does. Sounds like the rules of "Cycle Club" are still in full effect. Too bad. No wonder folks get turned off by cyclists, or from trying cycling if they get into this subset of dudes that seem to have sucked all the fun out of riding a bicycle. The weather this year, I'll tell ya! Weird! 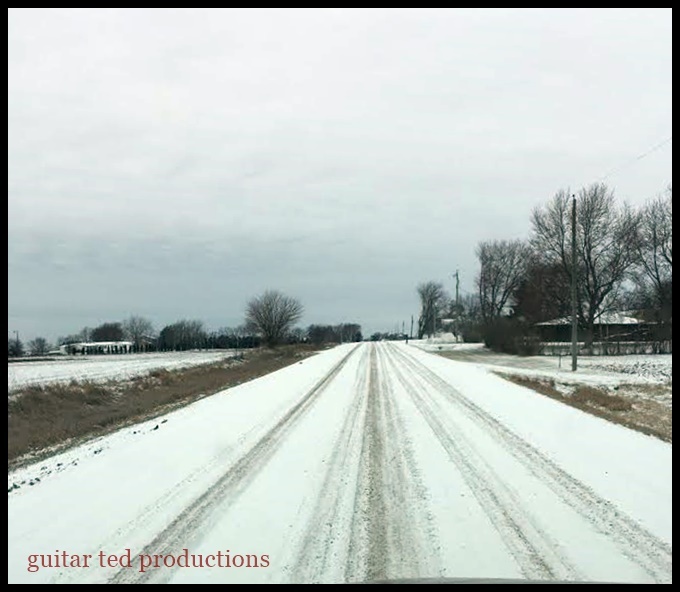 Anyway, we go from big rains in January, flooding, a warmer than all get out February, (minus a short cold snap in there), to a week out from Spring and a big, fluffy snowstorm. Hey! It's cool. It won't stick around long. 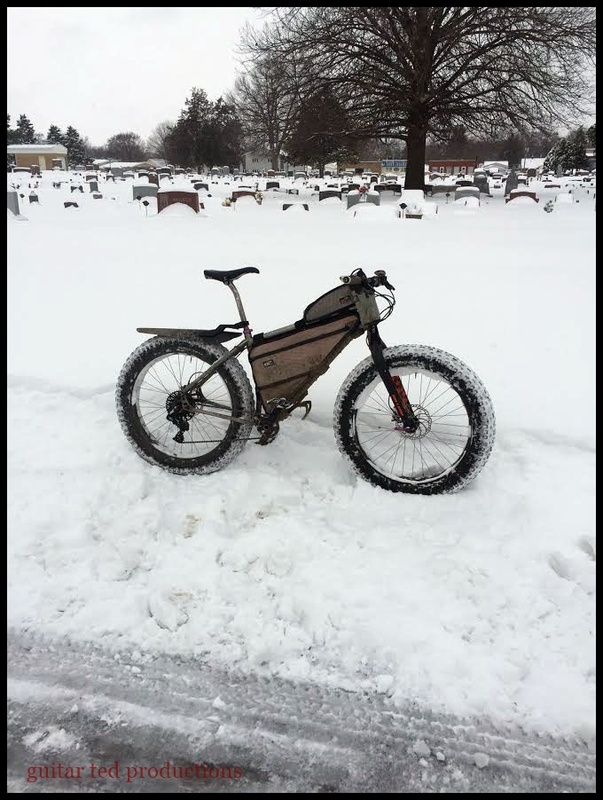 This was the best snow for fat biking we've had in a long time. Packs down, grippy, and doesn't give way laterally too badly. I am sure most of it will disappear in a few days though. The ground was unfrozen again before this snow and the more direct rays of the Sun in March are already eating at this snow from both sides. While it had that moisture in it, this wasn't sludgy, slushy snow either. It was that rare combination of moisture yet this snow would blow in the wind and drift too. I am glad I got to ride in it. Yep! I was glad. I know! I was surprised by this too. After 70°F, Sunny skies, clear gravel roads, and no-coat riding you'd think a return to Winter would tick me off. I thought it would tick me off. But riding to work on Monday morning I found that due to the great consistency of the snow and the beauty of the fresh coat of white stuff that I was actually enjoying myself. It looked like Christmas, and I was feeling great. It probably also helped that winds were low and the temperature was a very manageable 25°F which was just right. I chose a back way that utilized city streets to get to work because the bike paths and byways I normally use would still be under the 8" snow layer, or plowed up by snow plows. I thought it might take a while to get to work, but in reality, I made great time on the Ti Mukluk. Back home and done for the day. Work was pretty slow as far as customers, but that was to be expected with the fresh dump of snow on a Monday morning when most schools were on Spring Break. I had catching up to do anyway, and by the time I was to go home, I had made a pretty good dent in the work load. The ride home was going to be relaxing. I was also pretty fried from snow removal duties in the morning back at home. So, I was hoping that the snow removal teams across town had done their jobs. Mostly, they had. So, it was a fairly easy ride home with the exception of a couple of places where I was putting in "first tracks". Now with maybe one more day of decent snowy riding, I'll be looking at another "slop season" after that, as the temperatures and Sun will conspire to waste this snow into a slushy, mucky mess by Wednesday, I bet. In fact, I was going to clean off the Ti Mukluk but I have postponed that until after all the mucky-muck goes away again. Then I think we're on toward Spring and Spring-like weather for good. Yeah, we could get more snow. I mean, it has happened, but I don't think it will be anything like the 8" dump we just got. But, there was that April blizzard in the early 70's, and I have seen it snow to a measurable amount in May, so you never know. But I think we're out of Winter's clutches now and I cannot wait to start piling on some gravel miles. I've got some routes planned to do and one I want to piece together for a special ride. More on that later. For now I just want this transition to decent weather to happen and to stick this time. Last Fall I did the big loop and we got Trans Iowa recon off to a start. However; there were issues. First and foremost was the scrapping of the entire first leg due to one small bridge being out. Then there were issues with how the route crossed highways in a couple of places, and there was too much pavement. I went home from that Fall recon with more questions than I had gotten for answers. The Winter came in early, and recon had to be put off till when the roads got clearer. That happened in January, but I got sick, and then I got sick again recently. In between there I managed to get the first leg reconned. But that left a big reroute to look at. So this past weekend was the first shot I had at doing anything about the issues we found last Fall outside of the first leg being scrapped. It was a long haul to get there and I was accompanied by my recon partner-in-crime, Jeremy, on this mission. Once I rendezvoused with him Saturday morning, we headed South to Grinnell to eat at the Frontier Cafe. A short shout out: The Frontier Cafe is down town just off 4th Street on Main Street. We "found" this place a few years ago doing recon and were wowed by the reasonable prices and good breakfast fare. The restaurant is in an old downtown business building with a spacious interior that retains much of its late 19th Century appointments- A fully intact tin ceiling, Iron support poles made to look like Grecian columns, and wood panels and trim work. Back when we first started going there, things were in a bit "worn" shape, but this past visit showed that the Frontier Cafe has refreshed its look and it is very nice inside now. They still retained all of the past which was good. It is mostly a fresh coat of paint and some new do-dads here and there, from what I can tell. Go there if you want breakfast in Grinnell. The image doesn't do the steepness of this hill justice. Jeremy measured 13% with his Garmin. Anyway, we made it to our appointed spot on the course to begin the rerouting recon activity. There was a check right out of the gate. Pavement! Gah! Why do we feel the need to pave over everything? The map was consulted, then a choice was made. It will be part of the reroute now, but it did not eliminate all of the pavement. The irony of it all is that the paved part doesn't go past anything important and the unpaved part goes by several "McMansions". Weird. Then it was off toward another newly proposed section. Another checkmate! Another short section of pavement. Maybe a half to 3/4's of a mile. It stayed in. We moved on. Happily, there were no more surprises in the form of closures, missing bridges, or in terms of additional paved sections. In fact, the reroute got rid of about as much pavement as we ended up finding again. It was a wash. But all was not a loss here. The pavement isn't all in one long section now and we got two, much more safe highway crossings out of the deal along with some rad roads which we did not have originally. Besides this, we found two stellar convenience stores as well. Really, really nice ones. One is so nice I wonder if they won't kick out sweaty, dirty cyclists. I'm serious. I do not have the service hours, but their positions on the route guarantee you would arrive there long before closing times, if you arrive there at all. Just another steep climb, that's all. When we finished off the major reroute we headed back to a point I needed to check out at the finish of T.I.v13's route. Jeremy and I looked things over and made a final decision there. It will involve about 1/4 mile of riders riding on the shoulder of the highway against traffic to the head of a bike path. It was either that or cross a 4 lane highway twice. I think it will all be okay. And that was that. We nailed the recon and now we move on to the next phase of the preparations. The cue sheets will now get drafted up, and I will set the information into the final template. Then all we have to do is run the entire route one more time next month to verify the cues and roads before printing ensues. Other than that, the next time you hear anything about the course will be after the final run through we do in April.